ANGER: at the medical profession for “missing” something or not directing care in another direction, or perhaps for not giving the care to our loved one we feel they deserved. At our family and friends for not being more supportive or present. For the way they handled themselves before a loved one’s passing, or for things that have happened since. Anger at the person, disease, drug or mental illness that took our loved one from us. Anger at our loved ones for leaving us – or anger with God or religion or any other higher power for letting a bad thing happen to a good person. GUILT: at not being able to do MORE. Whatever that “more” may be…encouraging our loved one to take better care of themselves, or preventing them from going out the night they died. Guilt at not being able to prevent a suicide or drug overdose or car accident…feeling always that if only we could have just done “more”, they’d still be here. REGRET: at not saying “I love you” more often. For not spending more time together or for not always being physically or mentally present for our loved one when we felt we should have been. The list, truly, can go on and on. Because these emotions do just that – they go on and on, spinning us and scrambling us in a cycle that can become so dizzying and disorienting that we don’t know how to get off. There is no moving forward, only looping back again and again, which can lead to little hope of finding any hope at all. Ask anyone going through this, why do you allow yourself to become stuck in this cycle? Why can’t you move forward and move past these complicated and negative emotions? These emotions are so empty and meaningless and they serve no purpose…right? Because the big surprise is that these emotions DO serve a purpose and as soon as we can figure out what that is, we can stop the cycle and begin to move forward in a healthy direction. So, what purpose do they serve? 1. Control. One of the hardest things to cope with in loss is the realization that we have no control. Not just of our loved one’s life or their passing, but really of any part of life or what happens to us, or the people around us on a day-to-day basis. Can we try to be safe, and healthy and make good decisions? Of course, but even when we or our loved one do everything “right”, bad things still happen. This is can be nearly impossible to accept. So often, instead of turning ourselves over to that very big idea of having no control over anything in life we try to maintain that sense of control and it manifests itself as guilt…”I should have done more”. “I could have prevented it”. “If only I’d been there”. Guilt helps us maintain a sense of control in our world. 2. Connection. Ruminating, second-guessing, going over and over and over the events leading up to the death of our loved one can do a lot of things, but the one thing most of all? It keeps them in our thoughts. It can be a away of holding on, of never letting go. Of proving to them, ourselves and to the world that we will never forget. And by keeping them always in our thoughts, even with self-torturing and suffering thoughts, they are with us. It is our testament, our tribute, and our purpose- to keep them with us always. Even if it means we wither and suffer in the process. 3. Comfort. How odd it may seem to someone who has never gone through it, but there is a dark contentment to be found in the complicated emotions of grief. The feelings of happiness, joy, and humor become the clothes that no longer fit. And for some, anger can be a more comfortable place than sadness. Anger has energy, purpose and often times a target. These complicated emotions can just as easily become the distractions that sideline us from the real pain and emptiness that we just can’t face, or from the joy or feeling of moving forward that we’re afraid to feel. So…as I so often say in my groups…now what? If this is indeed true, what can we possibly do about any of it? Think of the times you’ve had something physically wrong with you. An ache, a pain, a sore throat or cough that lingers too long. We can live with the pain for a time, but the remedy is found in the diagnosis – and so the next step for a griever is to think about the “why”. Why am I holding on to these emotions? Starting with some of the reasons listed above, why – if I have decided that I want to and am ready to move forward, and I don’t want to feel this way anymore – WHY do I continue to hold on to anger, guilt or regret? Only you can answer this, but don’t rush it. Journal, meditate, sleep on it or spend time in prayer. Talk with a family member or trusted friend. While the answer of why isn’t always easily found, have faith in knowing that it is there, and the key to moving forward is found with it. Once you have decided on what the “why” is for you, then it’s important to figure out what’s next. We can’t simply say, “I no longer want to feel this way”, and expect it to happen. For some, this cycle is so ingrained it’s not easily broken. The focus needs to be on redirecting our thinking and our energy. Letting Go. If our grief roadblock was serving to maintain a sense of control in our lives, perhaps the first step is to figure out how to let go of that need to feel in control all the time. Letting go is probably one of the hardest things to do, but with patience and practice, we can continue to find some acceptance of the idea that we had no control over what happened. Stop here, and take a moment with that. You had no control over what happened. Repeat that to yourself, “I had no control of what happened”. Do this until the weight and burden you have been carrying has been lifted from you. By letting go we can realize that no amount of sleepless nights or overthinking or second guessing will ever ever ever ever ever change what has happened. The only thing we truly have power over is this moment -and this moment only. Create a Tribute. This is the most complicated part of grieving. How to move forward without leaving our loved one behind? If I experience joy, even for a moment, is it a betrayal to the loved one I’ve lost? Shouldn’t I always suffer in some way, to hold on to them and their memory? By creating a tribute, a memorial, or a ritual to our loved one, we can maintain our connection with them. We can move forward and bring them with us in a way that is healthy and healing for us. Some people do this on a large scale – a scholarship fund, or being part of a walk or fundraiser for a disease or a cause. Others do it in a smaller, more private way- wearing a piece of jewelry, visiting the cemetery or a special spot once a week, or even just kissing a loved one’s picture before bed every night. There’s no wrong way to do it, and a little time (and maybe trial and error) will help you find the tribute that feels right to you. Let your loved one be your guide. What would they want for you? The person who you grieve, whose loss has made it so hard for you move forward… what would they want for you? Some grievers have probably heard this as a friend has tried to help by saying, “your mom wouldn’t want you to be unhappy”. For most, I think it’s a statement that isn’t always taken as seriously as it should. What would they want for you? You know the answer. If they were here, if you could talk to them, they would comfort you and counsel you and urge you to pick up the pieces as best you can and to keep making a go at life. Turn to the loved one you’ve lost and hear their words. Rather than a passing suggestion, sit with this. Feel your loved one’s presence as you can hear their voice and just how they would say this to you. This may be a very painful exercise, but it serves both to maintain our connection with the loved one we’ve lost, and to take the advice we know they’d be giving us. None of this will happen overnight. Recognize that grieving is a process that we stumble through, and falter at. And while the process of grieving doesn’t have an official end because we will always grieve for the ones we’ve lost, there is the next step. A step toward healing, toward hope, and yes, even joy. 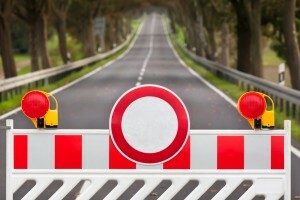 But we can only get there if we do the work to move the roadblocks out of our way. There are so many people out there who can relate to what you’re going through. Find them here at www.griefincommon.com. Sign up, create and search profiles, and maintain your connections with loved ones by starting new ones in their honor. Great article. In my case, after nearly 3 years of wanting to die after losing my partner of 40 years to Alzheimer’s, I found love. Love that made it possible to deal with all my emotions. Not the love of another person, but the love of a 1 lb. 11 oz puppy. His name is Wally and I adore him. I can not tell you how much he has changed my life. I don’t want to die anymore. I understand that this is a very simplistic method, but it worked for me. Very emotional to read because everything said in this is so true. Beautifully written. Tremendously helpful. Thank you. Very sad for me and understand others like me I read about so hurtful on families especially parents losing a child as I did almost 5 years ago my daughter passed away and I am broken inside and still living but unsure why somedays.I have 3 more children who need me i know and I am here for them but losing their sister has changed me so much but I pray to God for strength and support each day. thanks for listening. After reading this article, I felt much better but most of all, it gave me a sense of “normal” that all my feelings are a large part of the grieving process. It gave me hope that I will be able to let go someday. All this is true and helpful. But I also feel that anger helps keep me safe. As soon as I stop being angry at my ex, he stops respecting my boundaries. Without the angry reaction it would be more exoitation. Joe’s are relentless. I can’t figure out to let go of the wall without feeling like I’ve lost more than I held on to by putting it there. That said NPD, not Joe’s. Sorry. Spellcheck.